As you all know, I get quite a bit of inspiration for my hairstyles from TV, movies, magazines, etc. So far this year, such shows as Dancing With the Stars, So You Think You Can Dance, and America’s Got Talent have provided some great hairdoing inspiration. I am not sure how many of you are watching America’s Got Talent this season, but there is a very inspirational story there about two young girls (Christina, age 20, and Ali, age 13) who are overcoming the odds of Cystic Fibrosis, a deadly lung disease, to become very talented singers. Their backstory is quite emotional, as by the time I ended the segment, I was crying and emotionally blown away by their performance! Now… are Christina and Ali the most talented singers ever on the show??? 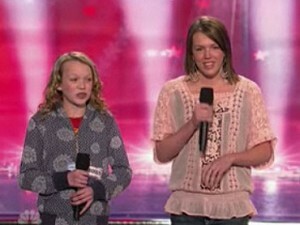 Very likely not, but for these girls to become as talented as they are when doctors told them they would never be able to sing… they have overcome tremendous odds!!! This is a fabulous family, which is very close knit and supportive of eachother. Their father is a county commissioner and mom is very musical. Both the parents and the children are active in their community and religion. The family has already lost one sibling to CF, and the four remaining siblings each continue to battle this disease every day knowing that death is just around the corner! What an amazing awareness these girls are bringing to the rest of us, of overcoming insurmountable odds to reach your dreams! If any of your are looking for an inspirational vote during this season’s episodes, please feel free to call in and vote for Cristina and Ali (and spread the word)! Episodes air on NBC Tuesdays and Wednesdays 9/8c. Here is the really cool kicker… these girls are part of my husband’s family (cousins)!